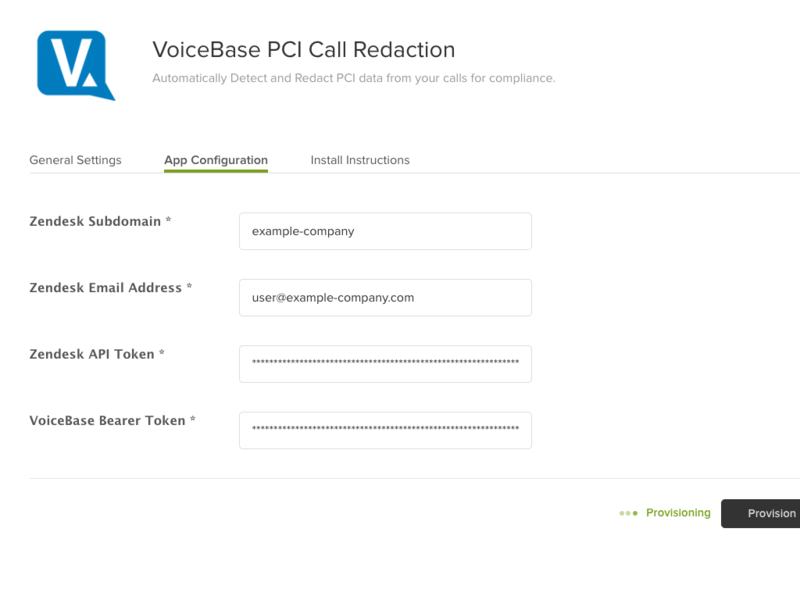 Automatically Detect and Redact PCI data from your calls for compliance. VoiceBase automatically detects and then redacts PCI (Payment Card Industry) data from your call recordings using a highly accurate speech recognition engine and proprietary machine learning algorithms. 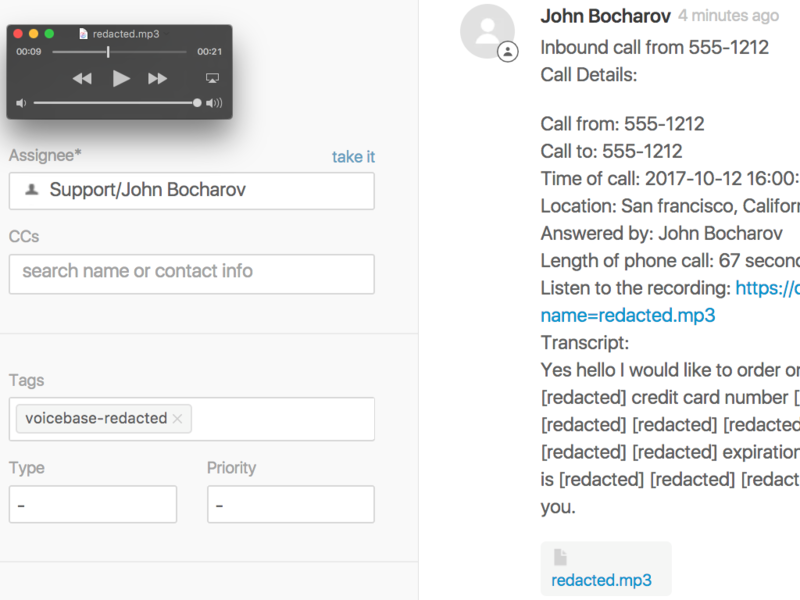 Using VoiceBase’s PCI Call Redaction and Detection for Zendesk Talk, you can easily query and share your Talk recordings to unveil rich customer insights without breaching PCI compliance standards. Important: This app needs to be provisioned with VoiceBase to become active for your account. Don't have a VoiceBase account? Sign up for one here. Open the Provisioning Portal in your browser. Enter your Zendesk Subdomain in the field provided. 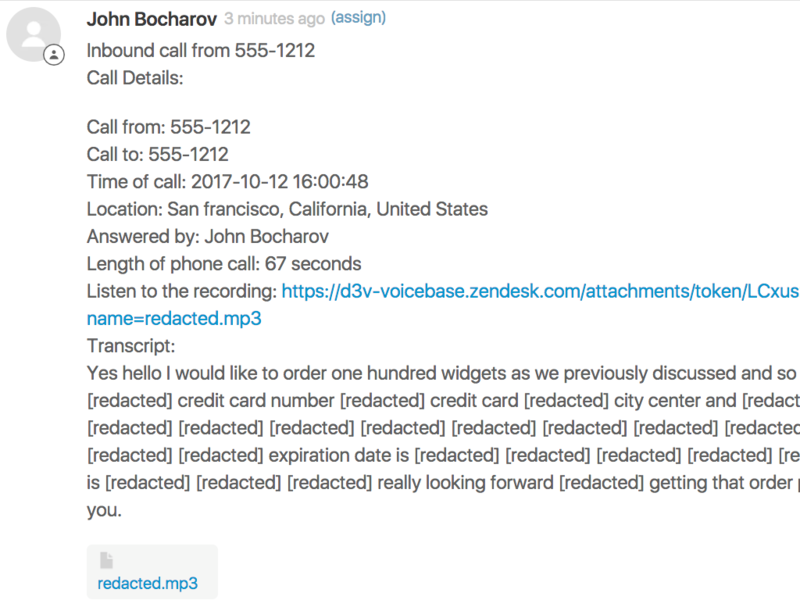 Enter the Zendesk Email Address for a valid user in your account in the field provided (VoiceBase will redact on this user's behalf). Enter your Zendesk API Token in the field provided. (Need a token? You can find instructions here). Enter your VoiceBase Bearer Token in the field provided. (Need a token? You can find instructions here). Click the Provision My Account button. Have questions or issues? Contact VoiceBase Support.